The Crook County Cowgirls knew going in that their game Tuesday night at Redmond was going to be tough. After all, the Panthers were leading the league with a 4-0 league record and a 10-7 overall mark, while Crook County has been struggling to be competitive, only winning two games this season. Still, no one could have predicted the quick start that the Panthers were able to get as they cruised to an easy 63-37 victory over the Cowgirls. "Their press was a pretty big problem," Crook County guard Dallas Hutchins said. "We had a hard time looking for our pass instead of dribbling up the court. And Kitchin kind of frazzled us a bit (Ava Kitchin, a 6-1 post, who blocked six Crook County shots in the game). Having her out there was like, 'Oh, we don't know what to do.'" From the opening tip, it was all Redmond. Just seconds into the game, McKaylie Capps hit a three-pointer to put the Panthers on top 3-0. Capps hit five more threes in the first quarter alone, as Redmond sprinted out to a 34-6 lead by the end of the stanza. 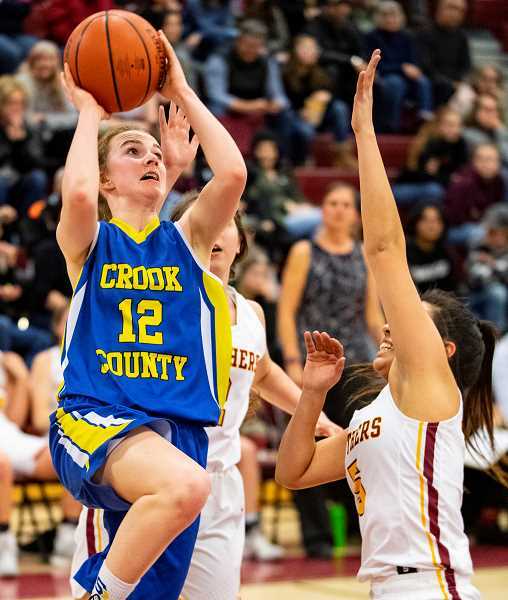 "We have to work on moving on the pass instead of waiting," Crook County head coach Heidi Lea said. "A couple of times we just waited until the pass got there and then made the move. They are quick shooters, so we talked about how you have to move and be there when the pass first arrives. Capps only hit one three after the first quarter, so we did a better job." The Panthers led 25-1 before they finally called off their full-court press. The press caused huge problems for the Cowgirls, who committed 34 turnovers in the contest, including 13 in the first quarter alone. Once Redmond called off their press, the Cowgirls were largely able to keep pace with the Panthers, but the damage had already been done. Both teams substituted freely the remainder of the game as Redmond coasted to the easy win. Redmond led 46-14 at the half and 56-22 at the end of three periods. Midway through the third quarter, Kitchin went down with an ankle injury. Without her size on the floor, the Cowgirls made a late surge, outscoring the Panthers 15-7 in the fourth quarter. "I felt like the girls didn't give up," Lea said. "We set a goal that we were going to score 40 points, so they were working towards that. At the end, they missed a couple of shots or they could have reached that goal." Capps played only sparingly in the second half but still finished the game with 24 points, most coming on long-range bombs. "They have two legit guards," Lea said. "Both Capps and Fox are good shooters, good ball handlers and quick, and then they have Kitchin, who is big, and when you have that, it's hard. Our girls didn't react. We wait too long to move, and we allow Capp to hit six threes in that first quarter and put on a three-point shooting clinic." Kitchin added 13 points for the Panthers, while Klanci Hinton chipped in with eight. The Cowgirls were led by Hutchins with 14, Liz Barker with eight, and Teagan Freeman with seven. However, neither Freeman nor Barker were able to score until the game had already been decided, while Hutchins had five of the Cowgirls' first quarter points. "I feel like offensively it was a pretty good night for me," Hutchins said. "But I feel like my defense could have been better." 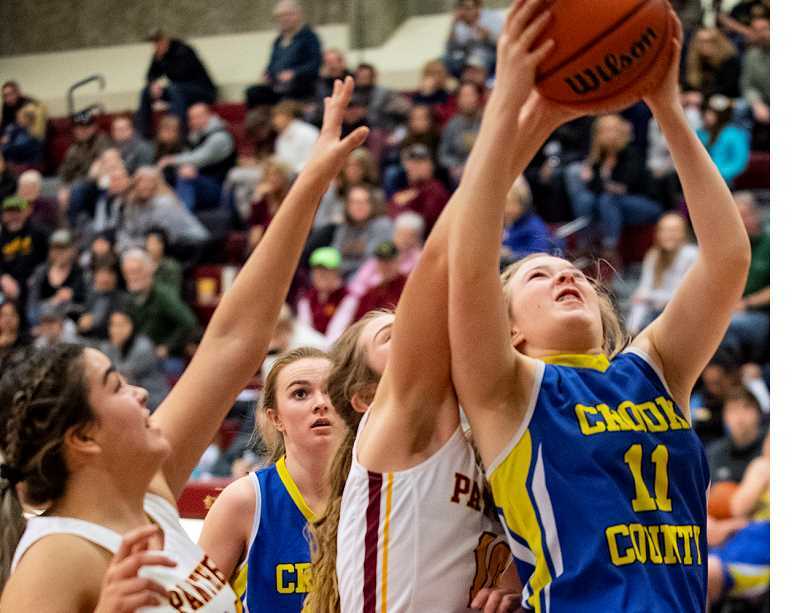 As has happened most of the season, one of the Cowgirls' strengths was rebounding, where Crook County outrebounded the taller Panthers 37-25. Maddie Rash came off the bench to lead all players in rebounding with six, while Freeman, Hutchins and McKinzee Mode all grabbed five rebounds. With the win, Redmond improved to 11-7 overall and 5-0 in conference play, while the Cowgirls fell to 1-4 in league and 2-15 overall. Crook County was scheduled to play at Pendleton tonight. However, that game was rescheduled to Thursday due to weather concerns. Following Thursday's game, the Cowgirls will be back in action on Tuesday, Feb. 12, when they host The Dalles, 9-7, 2-2 in a 6:30 p.m. game. Crook County – Dallas Hutchins 14, Barker 8, Freeman 7, Woodward 4, Kasberger 2, Ptomey 2, Guthrie, Ossenkop, Rash, Mode, Ramoss, Brooks, Papke. Totals: 13 9-14 37. Redmond – McKaylie Capps 24, Kitchin 13, Hinton 8, Corwin 5, Fox 5, Heikkila 3, Gonzalez 3, Roundtree 2, Spensley, Dove, Rodriguez. Totals: 25 4-11 63. Three-point goals – Crook County: Freeman, Hutchins. Redmond: Capps 7, Corwin, Fox.